The big Anglican news yesterday came as the Vatican announced the formation of an organization to receive Anglicans and Episcopalians into the Roman Catholic Church. What distinguishes this “ordinariate” from other ways of joining the Roman Catholic Church is that parishes and their clergy can join together, and these former Anglicans can continue to make use of some Anglican elements in their liturgy. There were articles in the New York Times and the Washington Post. Go read them if you want to understand the ordinariate and its function. Also, you’d probably want to visit the website of the ordinariate. Now, here at 7WD, there are a few things to note. First, most of the folks joining the ordinariate are not leaving the Episcopal Church. They already did that, if they were ever members. It’s largely a hodge-podge from the quasi-Anglican alphabet soup who are heading to this new home. Second, it’s worth noting that the numbers of Roman Catholics — lay people and clergy — who have gone the other way will dwarf these numbers. Rome is trying to stem the flow here, make no mistake. One wonders if these former Anglicans will be happy. I certainly wish them the best. When people feel called to follow Jesus in a different church, my prayer is that it will be a life-giving spiritual home. Generally though, when people leave one church because they didn’t get their way, it’s more likely they’ll leave the next one too. And I guarantee that the Pope isn’t going to do much negotiating over large or small issues. Converts who join the new entity will be full-fledged Catholics, expected to show allegiance to the pope and oppose contraception and abortion. But they will be allowed to preserve revered verses from the Book of Common Prayer. They will also be expected to oppose the death penalty and resist divorce. Both of those will be a stretch for some. The liturgy that they’ll be using (The Book of Divine Worship) is a Frankenstein mixture of the 1928 & 1979 American prayer books along with the Missale Romanum. I wonder how it will go over when someone in Rome notices this book and forces compliance with the new English translation of the missal. Also, I wonder if the familiar words of morning prayer will be enough to offset the absence of an Anglican Eucharistic prayer. While I was expecting it, it’s also jarring to read familiar lines from, say, the prayers of the people and note the inclusion of prayers for the Pope. Makes perfect sense, but one expects that Thomas Cranmer is rolling over in his grave. And, in what one Catholic leader called “an act of generosity,” priests who are married will be exempted from the Catholic requirement of celibacy, though they may not become bishops. Catholic leaders and some former Episcopalians are celebrating the announcement as a small but notable event in an often tortuous history of relations between the Vatican and the Anglican Church, which includes the Episcopalians, after their break in the 16th century. In many respects, that’s about right “Small but notable.” In numerical terms, this won’t make much of a difference either to the Roman Catholics or to Anglicans. But it certainly sets a new kind of precedent. “I’m excited about the opportunity for those who, for the most part, are already with the Catholic Church in their hearts,” Cardinal Donald Wuerl, archbishop of Washington, said in an interview. On that one, I agree. And, likewise, I hope Roman Catholics who would benefit from another expression of the church will seek it. “They told me to!” is not usually a valid defense. I would encourage Fr. Hurd and other Roman Catholics to imagine this scene: Episcopalians stand outside a Roman Catholic church one Sunday and encourage people to leave that church and join an Anglican church. Seem problematic? “It’s the largest reunification effort in 500 years,” said Susan Gibbs, a spokeswoman for the new body, called an ordinariate. Reunification is an interesting choice of words. This effort is assimilation, not reunification. Reunion implies some level of parity, and it assumes that something of both entities has merit. The ordinariate is more like the Borg from Star Trek than it is like an organic unity. “Resistance is futile” could well pass the lips of the current Pontiff, based on the structure of this ordinariate. This is something that too many Anglicans simply don’t understand; occasionally someone opposing this or that will say, “But we need to consider the ecumenical implications,” meaning Rome might not like it. Rome doesn’t even think we’re a church. Rather, Anglicans comprise “ecclesial communities” dressing up and playing at church. Not only are our sacraments “absolutely null and utterly void“, but our communities do not posses the grace of the Holy Spirit exemplified by a true church. So when you hear Roman Catholics talking with Anglicans about “reunification”, you should mentally translate that into “assimilation”. But people in both movements — Anglo-Catholics and Episcopal breakaway groups — tend to voice similar concerns about the liberal direction of the Episcopal Church. They mention the ordination and marrying of gays and lesbians; the ordination of women; and leaders who view the Bible as metaphor, not fact. The good news for folks who flee to Rome from “the liberal direction” of the Episcopal Church is that they will find a church that roundly condemns homosexual activity and women’s ordination. The bad news for them is that they’ll discover that there are gay clergy in Rome too. They’ll also be sorely disappointed when they learn that many Roman Catholic theologians and scholars do not, in fact, read the Bible literally. Rome never went through the Protestant fundamentalist/inerrantist movement of the 19th century. These refugees from liberalism will encounter a tradition of reading and interpreting scripture that will seem “modern” to them, though it largely predates the Reformation. Oh, and they’re going to find that many of their new sisters and brothers in Christ actually favor women’s ordination. Ruh roh. “If this papacy sees this as the only way to dialogue with other religions, that’s troubling,” said the Very Rev. Thomas Ferguson, who from 2001 until 2010 worked on ecumenical outreach. Ferguson is dean of Bexley Hall Seminary in Columbus, Ohio. Yes, indeed. Well said, Crusty Old Dean! “In addition, any former Anglican bishops ordained to the Catholic priesthood may use the use “the insignia of the episcopal office” after seeking Rome’s permission, and are entitled to sit in the episcopal conference with the status of a retired prelate. Yes, now we are getting somewhere. The one thing that binds together all those who are leaving established Anglicanism to form their alphabet soup is that each schism leads to more and more bishops. In this case, Rome’s celibacy rules are a barrier to these men becoming actual Roman bishops, but a few of them will still get to carry croziers and wear mitres. If Rome were to become serious about ecumenical efforts, there are three things they could do immediately. Issue a new teaching that cancels Apostolicae Curae. Accept that other churches, including Anglicans’, are real churches, also following in Christ’s apostolic tradition. Renounce the error of papal infallibility. Plenty of Christians, certainly including me, are willing to grant a primacy of honor to the Bishop of Rome. But the dogma of infallibility was an unwarranted invention in the church’s tradition and it’s unscriptural to boot. Clean up official Roman Catholic teaching in several other problematic areas. For example, issue a definitive statement that Mary is not, in fact, the Co-Redemptrix. 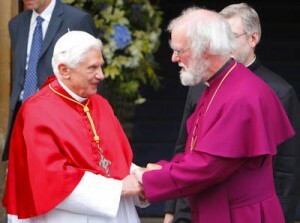 Then, continue in ecumenical dialogue with other churches. Attend our meetings. Invite us to yours, the way you invited guests to Vatican II. If some Anglicans seek to follow Christ in the Roman Catholic Church, so be it. And the same for folks heading the other way. Setting up structures like these is disrespectful at best. The path to unity lies in prayer, not poaching. Let us all pray, with Christ, that we all might be one. Actually we should consider the ecumenical implications of our actions, since gratuitously offending people is pretty stupid. Considering the implications is only a problem when it is a veiled demand that nothing be permitted to change without an ecumenical consensus. Of the three things you suggest Rome do to advance ecumenical discussions with Anglicans, the first ignores the practical alternatives, the third ignores the ways in which that disagreement might be finessed away, and the second, although it is the best, is a bit to narrow. What would really help us for Rome to admit that their teaching on any specific issue might be wrong, such that ecumenical discussion isn’t a case of trying to explain why RC doctrine either isn’t objectionable or is already believed in a “muddled” form by their conversation partner. Sometimes non-RC’s really do understand the doctrine, they just think it false, and Rome should be respectful enough to try to learn from them. Thanks for this helpful analysis, Scott. From one “kind of null and somewhat void” priest to another. I’m not sure whether your analysis is helpful. Anglicans have had this thing about Rome since we were declared to be null and void. I see no need to react. It makes us seem insecure. If people want that which Rome offers, fine, and if Rome lets them use elements of Anglican spirituality and liturgy, it demonstrates good taste! One point however. Most of the “splinter” Anglicans who were being led towards the Ordinariate have said “no thank you”. It looks as if there will be slim pickings in the USA. I do commend their choice of Jeffrey Steenson as Ordinary. He is a gentle, kind and learned person without a trace of arrogance. Tony, I won’t claim that anything on 7WD is helpful to anyone. I write for my own pleasure and the potential pleasure/edification of others. As for reacting, I was mostly provoked by the inaccurate media reports and Rome’s spin. The ordinariate itself is a snooze that will matter to a few hundred people. I’ve also heard good things about Steenson. His departure from the ECUSA HoB was as good as it gets. Glad you are well and blogging. I’m grateful that you stopped by to comment. Jonathan, I have no illusions that Rome will do anything ecumenical in my lifetime, let alone admit even the possibility of error. My point was to point out things that would be useful, rather than “reunification” campaigns. I don’t know, Scott – maybe this perspective is too simplistic and/or harsh – but my first *reaction* is that it seems to me that these are folks who want to continue to “worship the worship” AND allow it to disguise and legitimize their sexism, hetrosexism, and homophobia. My second *reaction* is to wonder about your claim that there are more RCs coming to TEC than the other way around. I certainly suspect that, but since there are no numbers kept by 815, we don’t really know that fer sure. Perhaps the recorded number of former RC priests being received as Episcopal priests might give us one indication. Does anyone know how we can get that information? I used to work at CPI and tried to collect that information when I was editor of the clergy directory in 2000something. Matthew Price’s department at CPG has some more recent data, but I understand it is incomplete.